My Boots are Back On! Yay! One step closer to resuming normal life. Bill was out of town and Cash turned up lame (more on that later) so I had to do some horse stuff, and I didn’t want to do it in my tennies. So I thought I’d give the boots a try, and I got them on! More importantly, I got them off again later, with no pain. I wouldn’t call them “comfortable” quite yet, but I’m not going to complain. Something all the experts will tell you is that when you’re working around horses, you need to wear the right kind of shoes. Have you ever had your dog step on your feet? Well, guess what – your horse will do that too. 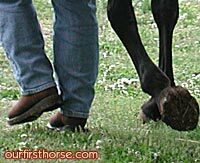 And need I remind you, your horse weighs considerably more than a dog, and has really hard feet to boot? (ha ha) I can tell you from personal experience that it pays to have the right kind of shoes. Until this weekend, I had been really lucky. I didn’t have any boots, but I always tried to wear sturdy shoes. Valentine swept over my feet a couple of times, but I was quick enough to get them out of harm’s way. Then last weekend, I finally got my boots, and I love them! They are Justin work boots – ugly but tough! Very comfortable too. (I got them at C&S Tack.) Valentine likes them too – he tasted them both thoroughly. Maybe they look like apples to him. I can’t tell the rest of the story without spilling Bill’s big news, so I’ll have to tell you…he got his own horse! That’s all I’m going to say. You’ll have to wait for his post to hear all about Static’s Blue Moon. But anyway, I was leading Blue Moon out of her stall yesterday, and she stepped squarely on my foot. It stung, let me tell you, but I was wearing my boots and they held up great. Today, the same darn thing happened, on the same foot – and I was wearing tennies. Big no-no. And I know why, now. Unfortunately for me, she stepped on the little toe I broke last year. I sure hope I’ll be able to wear my boots tomorrow. Owie.